Welcome to our website! If you're looking for quality dental products, then you've come to the right place. We are a dental manufacturing company that specializes in all types of dental tools and accessories. Take a look at the high-power micro motor units that we have available. We have motor units that are capable of an RPM of 32,000, 35,000, and even 40,000. Customers have also been pleased with our A.M.D. 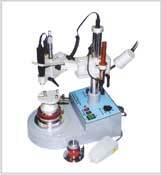 337-III Model Electric Milling System, our A.M.D. Hydraulic Press, as well as our A.M.D. 10X Microscope. The A.M.D. 337 Electric Milling System is our newest electric milling machine that comes with our Handpiece 102L (upgradeable to H.P. 110L). The jig and sprues holder come separately. We have just moved! Our new office is in Nazareth, PA. Please take the time to update your address books. At A.M.D. 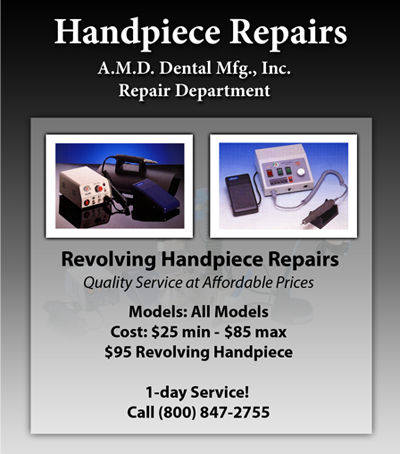 Dental, we provide quality handpiece repairs and service at affordable prices. ©2008 A.M.D. Dental Mfg., Inc.